Premier Music International Limited is an English manufacturer of drum kits and percussion instruments. XC Series – part of the 90th anniversary line. ^ Ltd, Eazytiger. "Artists". drumset.premier-percussion.com. Retrieved 14 May 2016. ^ "Mike Dolbear DRUMS | Interview with Clem Burke". mikedolbear.com. Retrieved 12 May 2016. ^ a b Ltd, Eazytiger. "Premier Music International Limited". drumset.premier-percussion.com. Retrieved 12 May 2016. ^ "Nick Mason's Drum Gear". ^ "Nicko McBrain celebrates 20 years with Premier Drums". MusicRadar. Retrieved 13 May 2016. 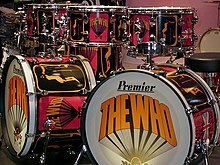 ^ "Premier drums to return to UK manufacture by 2012 (in time to celebrate its 90th anniversary!)". drumcool.com. 28 December 2011. Retrieved 12 May 2016. ^ Whotabs. "1967–1968 Pictures of Lily kit | Keith Moon's Drumkits | Whotabs". www.thewho.net. Retrieved 14 May 2016. ^ "Phil Selway's Rig". The king of Gear. ^ "Steve White ready to 'get hands dirty' in new Premier role". MusicRadar. Retrieved 14 May 2016. ^ a b c Youell, Andy. "DRUMARCHIVE.COM". drumarchive.com. Retrieved 13 May 2016. ^ Ltd, Eazytiger. "News – Premier launches British-made Modern Classic drum set". drumset.premier-percussion.com. Retrieved 13 May 2016. This page was last edited on 20 January 2019, at 15:42 (UTC).